Syria Update – Iraq Experience Keeps Public Cautious, Awaiting Evidence & Purpose, But Not All Bad For David Cameron. On behalf of the Mail on Sunday Survation interviewed 1002 respondents online on Friday afternoon and evening seeking their reactions to the Government’s House of Commons defeat over Syria. Underpinning the public’s caution over intervention, as well as scepticism that strikes could make a peaceful resolution more likely (just 13% thought they would), is the experience over the Iraq war. 81% of those not in support of action cited Iraq as an influence. 65% of those asked, said that post Iraq they were less likely to trust a Prime Minister when deciding on action – 55% said they could not trust Cameron’s judgement over whether Assad was even responsible for recent chemical weapons attacks. Tony Blair’s support for action was considered to have weakened the case by 40%, to 8% thinking he had strengthened it. Where might public opinion progress from here? Despite deep scepticism that airstrikes assist “peace”, some form of military action is deemed more justifiable if UN weapons inspectors could prove conclusively the Syrian regime was behind chemical attacks – 44% saying UK action would be justified in this case to 36% disagreeing. Further chemical attacks on a mass scale tip opinion – 47% to 30% believing intervention would be then justified. Greatest support for military action (50% to 25%) was seen in the case of chemical weapons being in danger of falling into terrorist hands such as groups linked to Al Qaeda and in the case of a Syrian retaliation response to a US strike on British allies like Turkey and Israel. So in summary, despite being war-weary and sceptical, the public clearly do share the Prime Minister’s concerns over atrocities committed in Syria (and this poll shows an underpinning of support for these concerns). However, trying to rush the public and their MPs into a change of heart over intervention now has clearly misfired. Any change of opinion will take time, evidence and a convincing case of its benefit. 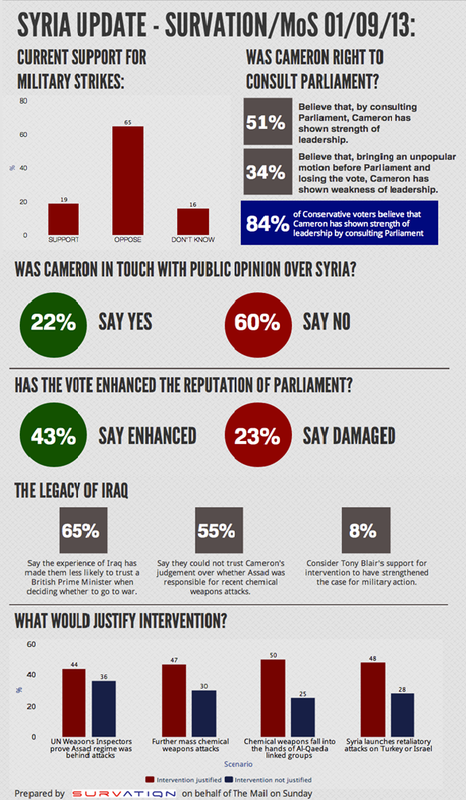 Survation / Daily Mirror: Iraq – 10 Years On.